This reminds me of Sushi Station, one of our favorite places to go for Sushi around here. 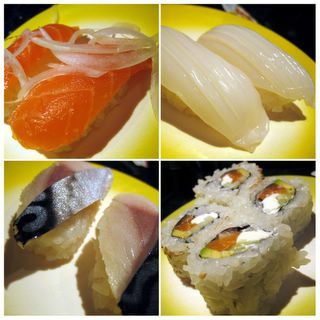 Even now, I miss sashimi (just can't handle the rice now). That's the first thing I want to eat after the baby is born next summer. Oh well. After I get over the first trimester food aversions, I can at least go back there and have some unagi, and baby some of the vegetarian rolls. Oh. $1.99 for a spider roll? Sweet! It's $5.00 at Sushi Station. Another gem in the city of Tustin!! Long-time reader, first time commenting. Now I have a serious craving for sushi. Everything you ordered looks amazing. Thanks for making me laugh first thing this morning! Here's hoping your hair doesn't start to fall out any time soon (it's probably not very nice for me to make jokes about polonium poisoning, but oh well). Carlos the Jackal is coming to get you. "It's Elmomonster in the Monster Munching Identity. One man, one mission, one way out. Pass the wasabi!" I need to stop leaving the office at midnight. dah! I wish that I liked sushi...i just can't handle the texture of raw fish. :( This place is SO close to home too. 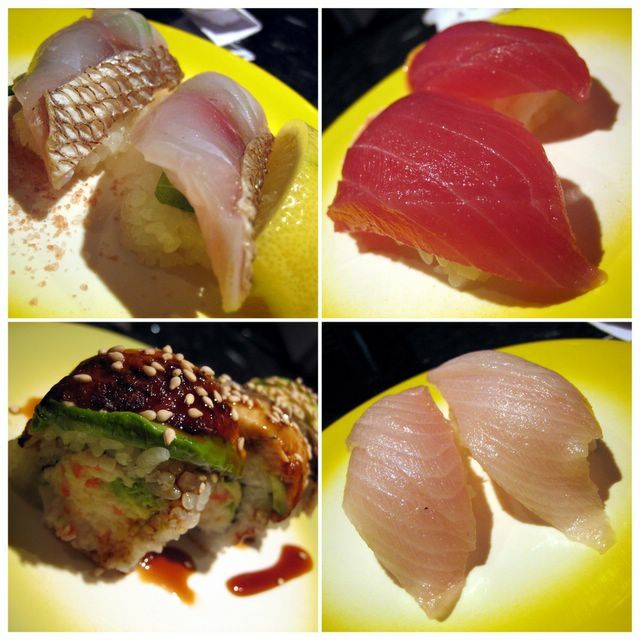 geesh thanks for the mouth watering pictures...matter of fact I will be at Angotei for some fishy myself. Great Fishy post. Is this place near Newport & Main? There are several 'conveyor belt' sushi places in Portland and I have to say...they are very good. This is the first one I've heard of in O.C. Great video! Very impressive sticker price Elmo! I've only had bad luck with those sushi boat restaurants, because they never have those "nifty lids" to prevent the spread of nasty bacterial organisms and because the tepid sushi tastes sloppy, soggy, and lukewarm. I'd try that place, although the mechanical conveyor belt though does give me pause. Also, about you friend giving you the finger--I have one of those friends too, who always likes to jokingly stick his middle finger in front of my camera as I try to take a "perfect" food shot. I always end up with multiple shots of him giving me the bird, but sometimes on a good day, I will act relatively amused! Here's looking forward to your sushi feast come next summer! And yeah, spider roll for $1.99! Perfect for a cheapskate like me! Tustin continues to amaze. What is it about this city that attracts the coolest and most inexpensive eateries? Thanks for the compliment on the video. I hope to make more when the occasion calls for a full motion capture. Hey thanks for de-lurking! Because you did, I just discovered your site and am going to put you in my blogroll, if you don't mind. Glad to be of service! I heard a story on NPR, I think it was, about how all this was spurring renewed interest and nostalgia in those Cold War spy stories, like those written by Ian Fleming. Cue the Mission Impossible theme song. Not the sucky one by Limp Bizkit, but the original. Well at least that's not as bad as an allergy to fish. Nothing worse than being allergic to something you actually like! Need to go to Angotei. Need to soon. Even if their sushi doesn't loop on a moving walkway. I would've loved to see his face and captured it on video! It's actually on Newport and El Camino Real. Right behind the Rally's in the same parking lot! I heard there's another revolving sushi joint in Santa Ana too. You and I share the same basic fear of these type of places. Sometimes, I think it would be faster if the waitress just brought over the sushi to our table. Also, when I walk in to one of these places, I scope out the prime location to sit: the seat that is the first to see the sushi come out of the kitchen. It's the only way to be sure that the only person to touch the sushi is the chef himself. Usually it's close enough that he can just hand you the food. At this place it seems that it is the booth immediately to the right of him. We were on the booth to the left, which meant we were at the end of the line. My friend amuses me too. In one shot he actually stuck his head into the frame over the sushi conveyor belt. I should've included that footage and shown all of YouTube what a clown he is. We have our share of conveyor belt sushi places here in Hawaii, and while I frequent them often, I can never help but wonder how "dirty" my sushi is, hehe. I should propose the lid (and $1.99) concept to restaurant owners here! :)...though I'd doubt they would consider the latter! And I promise to start commenting more often. Whenever I start reading a new blog I feel weird commenting on posts older than a week because I don't know if the blog owner ever sees them. hmm, i went here a few weeks back and they didnt use any plastic covers for my plates. I did however sit near the sushi bar so our plates were to the first to come out. I went here today because of this review. I went for lunch. They had the conveyor going with signs ONLY rotating so that you had to still order from the waiter. NO SUSHI ON PLATES WAS THERE. This defeated the whole purpose!!! I wanted to eat like a pig and pull stuff off the conveyor and eat it right away! I was so disappointed. I guess because it was slow. but things like this will insure that business remains slow at lunch time. The lids put me at ease, but the $1.99 kept me ordering. Although not all of the sushi is lidded. Most were. Some weren't. I'm not sure the reason for the inconsistency. Maybe charging $1.99 makes their profit margins thin enough that they can't afford to spring for more lids? No pressure to comment at all! Just read and enjoy. That's all I ask! ;-) BTW, I'm slowly working through your archives. The first time I had raw oyster in this style was from Yoshi at Maki-Zushi also. Yup, I finally sprung for the omakase there. Cost me $75 but it was worth it. These Kumamotos are just as good, but not as special, since Yoshi served his on a bed of crushed ise! Hey dude! Long time no see! That totally blows that there were no pre-made sushi revolving around during lunch. If there's any time they should have the full rotation going they should do it at lunch! But admittedly, since I was a little apprehensive that first time I went there, we ordered everything off the menu. And like I said to PE above, it would've been faster if the waitress just came over and served us the sushi. Whoa... $1.99 per plate? Shiatsu! I may have to check this place out mid week!!! :D I haven't found a good conveyor belt sushi place in a long, long time... maybe never! ps. LOVE the video too!!! It's pretty good for $1.99 and the fact that its a revolving sushi bar. Fridays and weekends the price rises to $2.50 per plate. Still pretty reasonable, I think. It's worth at least one visit. Novel and quite fun too. wow that looks pretty good for $1.99 and being on a belt. that's great about the covers and stickers too. what usually happens to me though is that the people in front of me take all the sushis that i wanted and then we have to wait forever for new ones to come out. I've been reading your blog for a while now and have eaten at several places you suggested and loved them all! I was actually pretty excited that you reviewed this place because I live nearby. My friends and I were actually considering going there after we received the flyer in the mail but were apprehensive and decided on another of your recommendations (shibucho, which we are never going to be sorry for chosing instead of sushi 5). But since I read your review I dragged my boyfriend there on Monday and was glad I did. You're right, the anago was sublime! 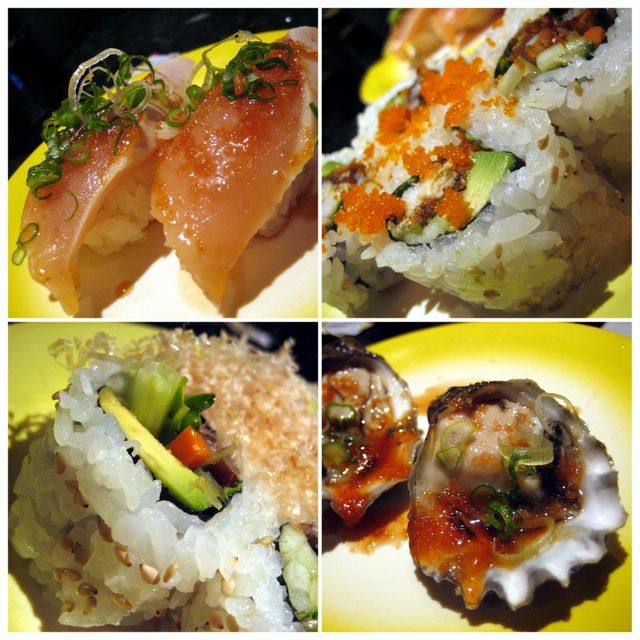 I also tried their blue crab roll, while no match to Wasabi, was very very tasty! Can't beat $1.99 sushi with a stick though. The sushi was pretty good(especially for the price). And I loved that they also had private booths for when you want to pig out on conveyor belt sushi in private. =) Like another commentor they didn't have any sushi going around the belt unless ordered but I equate that to the small number of patrons and the late hour. they did, however, run out of rice while we were there. That is a cardinal sin for a sushi bar in my book and the only con that I found so far. We would have gladly ordered more sushi if that had not happened. But all in all, we had a great experience there and thank you for your recommendation...and for our $45 bill (for like 20 plates of sushi!). That's probably what's happening at Sushi 5: people in front are hogging all the stuff that comes out. But that's fine by me. I'm an orderer. I likes control! Awesome! Thanks for reporting back. This is going to be our default sushi place (because I'm cheap and can't afford to go to Shibucho every week). And I've never heard of a sushi place running out of rice! That's frickin' insane! Caltrops! Aren't those those black horn thingys? HAHA! Well, thanks for discovering me. Hope you stick around. Just found your blog too. Me likey. Wife and I just tried this place last night, because Sushi Wasabi is still on vacation ("we'll be back on the 12th, but, call again because we're not sure!"). Excellent, excellent value in sushi. We ate 20 plates between us plus an appetizer, and the bill was less than $50. At 8:30'ish, the kumamoto oysters, the king crab roll, and the mirugai were already sold out for the evening.. sadly.. But the anago was as good as you described, the hamachi was pink and tasty, and most of the rest of the dishes were nicely done. I'm not too enamored of the soft shell crab roll, though, and my wife wasn't entirely pleased with the uni. They had toys going 'round the conveyers too- a mini rc car taped to three plates, and some plastic thing that I didn't pay too much attention to, on a single plate. I think I'll have to go back with the kids! So glad you enjoyed it! It's a real bargain isn't it? I was there earlier this week also. But I actually was over the moon about the uni. I think it was the right timing. He had just took out a fresh box. 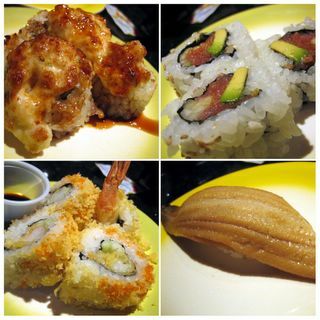 In fact, I ate at Bluefin yesterday, and I have to honestly say, I liked the uni at Sushi 5 just a slight bit better...but everything else at Bluefin -- "c'est si bon!" I went here again to give it another shot. I went on a Tuesday night and AGAIN no conveyor! I give up. You had to order from the chefs. Why would you open a conveyor restaurant and never have it running. So frustrating. Sorry to hear that Diamond Dog. You're right. I've been there twice since this first trip. Each time, the conveyor belts were running, but without much on it. But being still slightly paranoid, I ordered off the menu...pretty good I must say. And cheap! We went last night and it was great. The conveyer was going and it was cool that all the sudden extra stuff would just start coming out and if it looked good, you grabbed it. It was very tasty stuff. We will definitely be going back! Glad you enjoyed it Martin! I go almost every other week now. And of course only on M-Th when it's $1.99 per plate. My sense is that the food is just a vehicle for the writing instead of the other way around. Sometimes, you get too clever for your own good and use a phrase because you like how it sounds even even if its irrelevant to the food. For example, writing that the tuna was "red as a luscious maraschino cherry." To a person who doesn't know anything about sushi, it sounds like a compliment and something they should look for next time they eat tuna. But, from a foodie perspective, I hate that phrase. They were using carbon monoxide on that tuna to enhance the color and prevent it from turning brown. In of itself, CO isn't that bad- its tasteless but what it does do is keep the tuna red even after its gone bad. And, the sushi here wasn't that fresh went tried it. PS- if you are going to look at color, go for something with a more pinkish color. It means there's more fat, and fat is flavor.